At Primrose, we are sensitive to the fact that this is a new and emotional experience for you. Undoubtedly, you will encounter situations about which you will want to ask questions, make suggestions, or voice concerns. We recognize that good communication is a key component of providing quality services and encourage it. To assist in the communication process, we’ve provided a list of the management team at Primrose. The brief descriptions of our duties will assist you in determining from whom you might best obtain an answer to your particular question(s). For those who find it more convenient to communicate by email, we have included our email addresses. Please never hesitate to contact us with your questions or concerns. The more we both know about each other, the better we can do for you. John coordinates all departments to insure each department is in alignment with goals, budget guidelines, and resident needs. He is responsible for the day-to-day operations of Primrose. John is also available to discuss any issues or questions you may have concerning the operation of Primrose, during business hours 8:30a.m-5:00p.m. Dan is the direct supervisor of our Resident Assistants, who provide daily care (baths, meals, etc) to residents. He coordinates the nursing and medical aspects of resident care by working with all of the Primrose departments and the medical community. Dan works hand-in-hand with the Program Director to assure that the total needs of our residents are being met. Dan works Monday to Friday 9:00 am to 5:00 pm. Viki represents Primrose to the regional network of dementia services, agencies, and providers. Viki also is responsible for education outreach regarding memory impairments. Viki assists families through the complete move in process, beginning with inquiry and ending with move in. 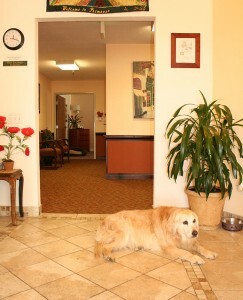 Viki is normally on duty from 8:00 am to 5:00 pm, weekdays and by appointment on Saturdays. Nick is responsible for keeping Primrose beautiful and functional. He takes great pride in maintaining the picturesque garden setting and spacious courtyard surroundings at Primrose. In addition to the grounds, Nick directs the maintenance and housekeeping teams. His hours are from Tuesday – Friday approximately from 5:00 am to 2:00 pm. Jack is responsible for the food service program and the catering services at Primrose. He heads the team of chefs that produce the meals for the residents and visitors. He also coordinates the staff to produce a pleasant dining experience. Ask him about nutrition, dining, and dietary concerns. His hours are from Tuesday – Friday approximately from 5:00 am to 2:00 pm. Cynthia is responsible for the daily management of the Primrose Day Club, an adult day service for persons experiencing memory loss. She provides quality programming to persons with dementia in order to extend their independence and quality of life, as well as to give family care-givers a break from their overwhelming responsibilities. Cynthia’s hours are from Monday – Friday, from 8:30 AM to 4:00 PM. Jennifer coordinates the community education and support component of Primrose. She provides resources to families who need emotional support, have questions about dementia or the role of care giving. Jennifer provides directional support to all aspects of our programs. She also composes the Primrose newsletter, Primrose Press, published monthly. Her hours are Tuesday through Thursday from 9:00 am to 5:00 pm.